Amtrak Philadelphia service resumes to New York with mandated safety improvements. The site of the Amtrak 188 crash as seen from the first northbound train to leave Philadelphia’s 30th Street Station after service resumed Monday morning. 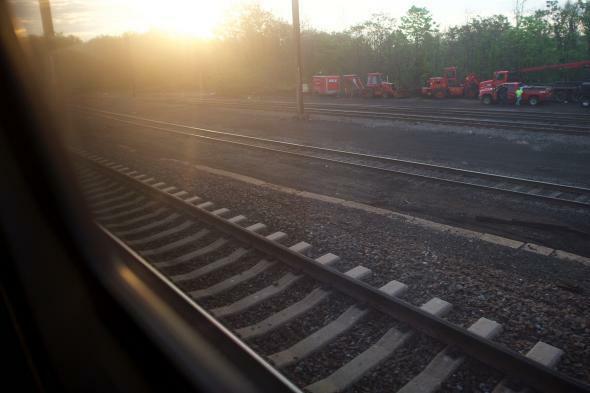 Amtrak trains returned to the tracks between New York and Philadelphia on Monday morning, and cars traversing the curve where Train 188 derailed last Tuesday night are now governed in both directions by the Automatic Train Control system, the New York Times reports. The ATC system, which can apply brakes remotely on speeding trains, was previously in effect only for southbound trains on that stretch of track, which were considered more at risk of accidents because the drop in speed limit is more dramatic coming into the curve than it is for trains traveling north. Train 188 was northbound when it left the tracks, killing eight. Several news outlets had reporters at Penn Station in New York on Monday morning to cover the first train—No. 111—headed to Philadelphia in nearly a week. While there have been no specific reports of difficulties, the first trains in each direction apparently arrived late. Amtrak’s website shows that 111 left New York on time at 5:30 a.m. but arrived in Philadelphia at 7:25, 32 minutes behind schedule. The first northbound trip from Philadelphia, train 110, left the 30th Street Station at 6:09, 16 minutes after its scheduled departure at 5:53, and arrived in New York about half an hour late at 7:50.